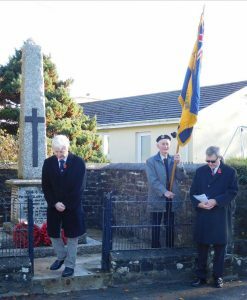 Thornbury joined the rest of the country in marking the centenary of the Armistice that ended the First World War, on 11th November 1918. This page describes the ways in which Thornbury marked this significant event, through words, pictures and sounds. 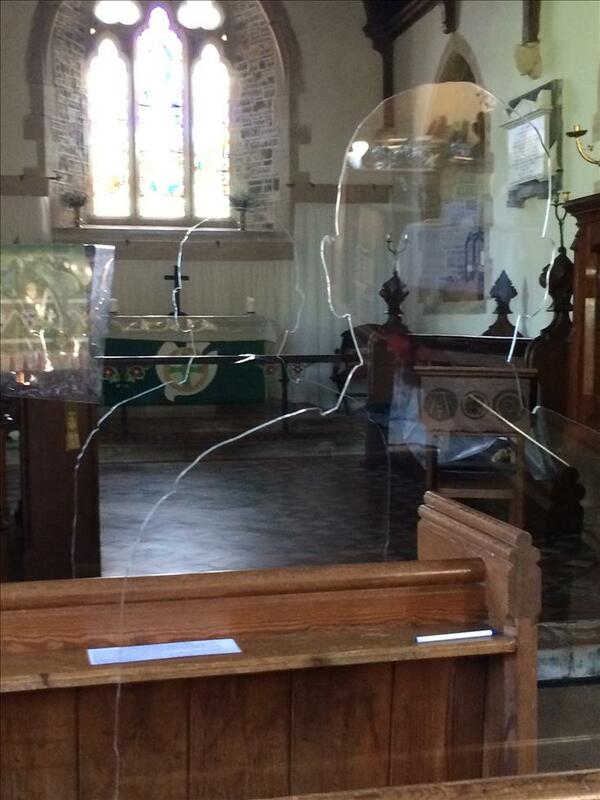 As part of our commemoration of the 100th anniversary of the end of the First World War, Thornbury Hamlets celebrated the award of two silhouettes funded by the Armed Forces Covenant Fund Trust, to mark the deaths of the two Thornbury men who died as a result of the war. These silhouettes were placed in the pews at St. Peter’s Church and made a real impact. 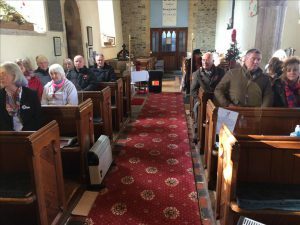 During the Remembrance Service, members of the congregation sat alongside the ‘missing’ men. 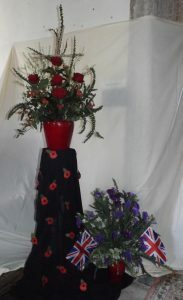 The silhouettes will be kept for use at future Remembrance services. 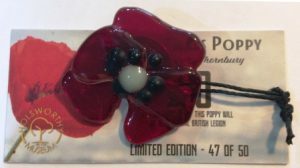 Holsworthy Museum acknowledged the sacrifice of the 39 men from the town who died in the First World War, by selling a limited edition of 50 glass poppies which were made in Thornbury, in aid of the Royal British Legion. £400 was raised. 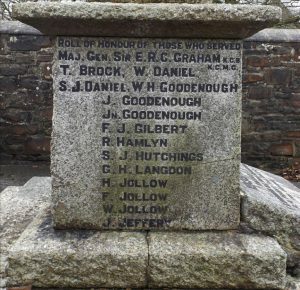 The inscriptions on Thornbury’s War memorial, at Woodacott. Killed in action: Sergeant Thomas Skinner, died aged 27, 4th September 1914. Died as a result of the war: Walter Jollow, died aged 34, 27th February 1922. Frederick Osborne, died aged 20, 22nd May 1941. Herbert Priest, aged 20, 19th October 1943. 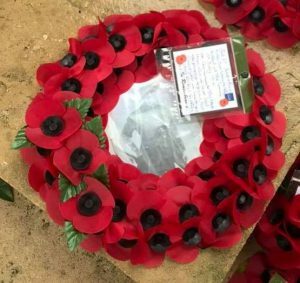 At 11.00 on 11th November, residents gathered at the War memorial at Woodacott Green, to remember all those who served or were affected by war, and especially the two men who gave their lives in the First World War, and all those who served in both World Wars as listed above. David Whitehead, the Churchwarden of St. Peter’s, led the ceremony. The standard was carried by Arthur Sillifant. 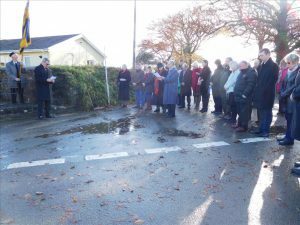 The Roll of Honour was read by Keith Hutchings, Chair of the Parish Council. 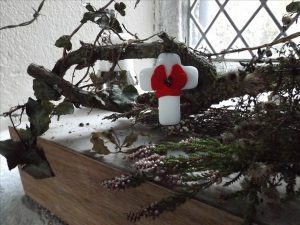 Wreaths were laid on behalf of Thornbury Parish Council and St. Peter’s Church. 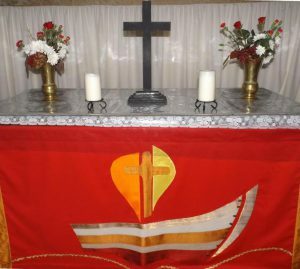 After the ceremony at the Memorial, a service was held at the Church. 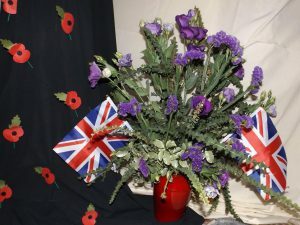 St. Peter’s Church was decorated with a series of flower arrangements, reflecting the theme of conflict and remembrance. 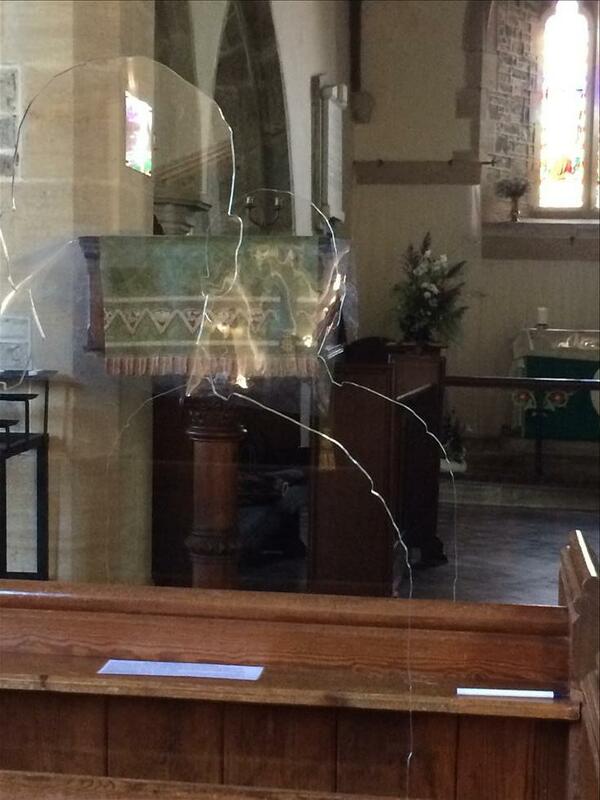 The congregation at the Church included two silhouettes funded by the Armed Forces Covenant Fund Trust. 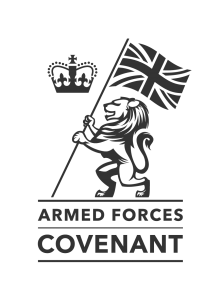 The award was made under the Armistice and Armed Forces Communities programme, which makes awards to bring communities together to remember; and to think about the Armed Forces today. 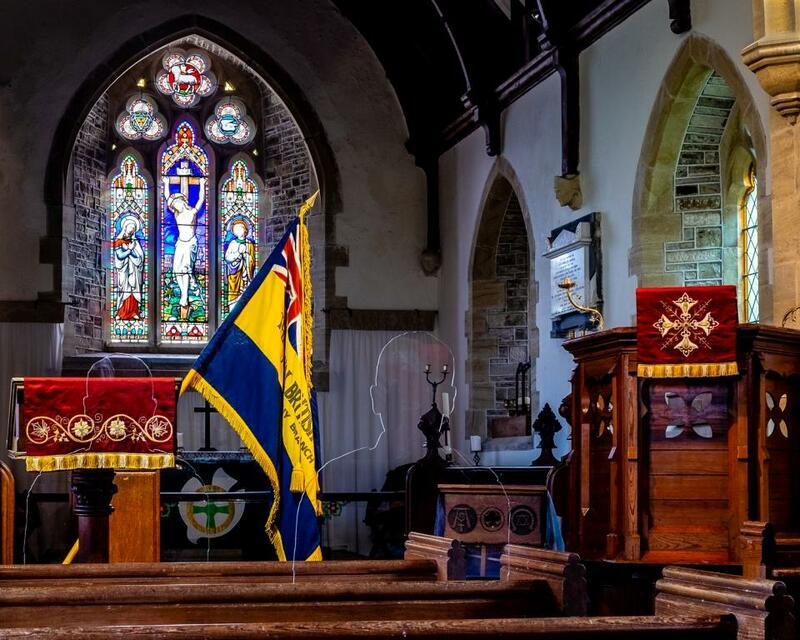 Here is the Order of Service that was followed, at the War Memorial and at the Church. As well as the hymns, three poems were read: these are reproduced below. She was so moved by these words that she wrote her own poem in response, and vowed to always wear a red poppy in remembrance. Back at her university after the war, she worked with disabled veterans, and saw the sale of poppies as a way to raise funds for them. She went on to get the poppy adopted as the US national remembrance symbol and campaigned for veterans for the rest of her life. 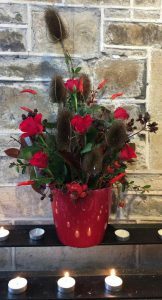 A French woman named Anna Guerin brought the remembrance poppy over to England in 1921, and the newly-founded British Legion was so enthusiastic about the idea, that they ordered 9 million poppies and sold them ALL for the first Poppy Day on 11th November that year. This is one of two poems written by Simon Armitage in 2014 in response to objects in the Imperial War Museum. 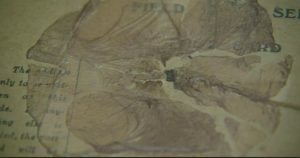 This one was inspired by a pressed poppy which soldier Joseph Shaddick sent from the trenches to his family home in Devon. It now lies, pale and brittle,in the archive of the Imperial War Museum. The poem is reproduced here, by kind permission of Simon Armitage. of its petals and stalk. or think it a heart. On 11 November 2018, communities gathered on beaches across the UK to say goodbye and thank you, to the millions of men and women who left their shores during the war, many never to return. 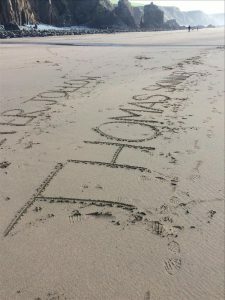 On selected beaches around the UK, over the course of several hours, a portrait of an individual from the First World War was drawn in the sand. 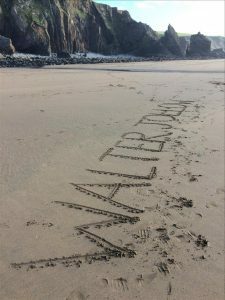 And then, as the tide rose, they were washed away. 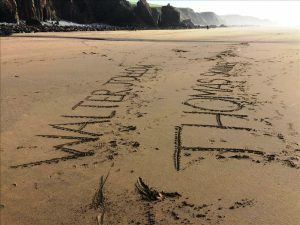 Thornbury’s own contribution was to write the names of our two dead from the First World War in the sand of Sandymouth Bay, to be washed away at high tide. 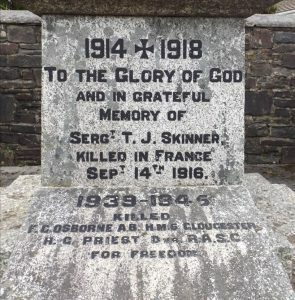 In the evening, the bells of St. Peter’s Church were rung, to echo the ringing of bells throughout the land at the end of the “war to end all wars”. 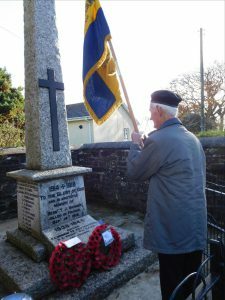 Between 1914 and 1918 regulations introduced under the Defence of the Realm Act severely curtailed the amount of bell-ringing that could take place. This, together with the departure of so many men to the front, meant that church bells were rarely heard. 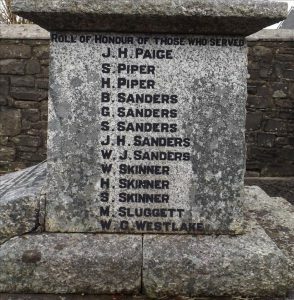 Ironically, with so many ringers at the front, accounts from the time recall how the bells that announced the end of the war on 11 November 1918 were not rung particularly well – even though it was through their ringing that most people learned of the end of the war. 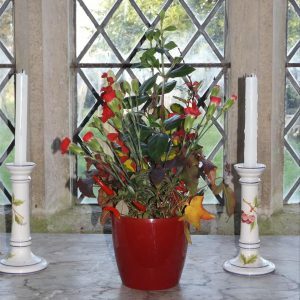 Older ringers, former ringers and just about anyone who could lend a hand got involved. 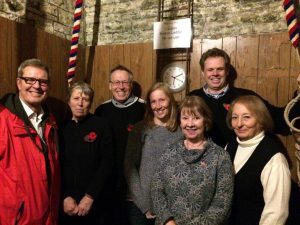 Here is the team of ringers that met at St. Peter’s Church on the evening of 11th November 2018. In the audio clip below, we move from the sound of the audience inside the church, into the clear night air below the church tower. A fitting end to rural Thornbury’s day of tribute to those who served and lost so much.